First new Van Halen album in 14 years is now out. Van Halen is back with an all new album of outtakes and demos they created back before their first album was released. That’s 1976 era for those keeping score at home. Let’s take the cleaning up of older songs and an alcoholic guitar god, patching things up with Diamond Dave, firing your original bass player, bring in the steady drummer and then bring in the now-sober EVH’s son Wolfgang, and you have thriteen tracks brought to life in today’s world. 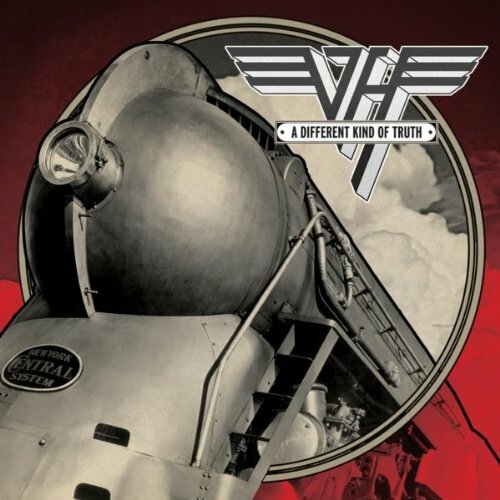 Simply put, this long time VH fan likes this album a lot. Getting the “what I didn’t like” out of the way first…I didn’t like the lead single “Tattoo” and “Honeybabysweetiedoll“. The songs themselves are the weakest on the album. Not horrible, but not ones I prefer to listen to. Also, Dave’s vocals appear to be strained at times.. like he’s trying to hit some high notes – which he does – but there’s some notes here and there that are a level lower than what we are used to him hitting. And I have to note that the harmonizing perfect tones of Michael Anthony are sorely missed. Yes, Wolfie and his dad can sing, but decades of hearing it with Michael means there’s something amiss here. Ok, with that out of the way, the other 11 tracks and just about every note that DLR and EVH hit were so good. In fact, I really liked this trip back in time that I never knew existed. Some call it a safe bet. I call it dusting off some tunes they knew could work. And do they ever work. My favorite tracks are “Outta Space” and “You And Your Blues” – both excelling on every level. Eddie is at the top of his game again and it’s pretty obvious he’s traded his hooch for his guitar. Wolfie is not a bad bass player and he’s come into his own here on his first official album debut. The other nine tracks are just as good on many levels. Other than my mentions of some vocal stuggles here and there, Roth hits it good. It’s entertaining. It’s fun. It’s lyrically silly. If we are talking about going back to the beginning, a dead ringer for the song “Ice Cream Man” on the first album is “Stay Frosty“, my pick for most underestimated track of this album. Cheesy lyrics, but in the vein of a blues number, this song is fun to listen to. I’ve put in a good 25 listens to this album and with the exception of the afore mentioned two songs I skip, I really like it. It gets better with each listen and I’ve yet to grow tired of the remaining 11 tracks. If you are a Van Halen fan, it’s worth picking up. If you are curious, find someone that has it and ask to listen. Or use the 90 second sound clip option on iTunes. Anyone have this album yet? What are your thoughts so far? The first time I heard “Tattoo” I hated it. Now I like it. A lot. “Stay Frosty” definitely reminds me of “Ice Cream Man”. I haven’t spent a lot of time listening to the album yet. I have the CD in my truck and haven’t gotten around to uploading it to Google Music yet to listen to at other times. I really need to do that. But overall, the sound is reminiscent of VH1 and VH2. Maybe “Tattoo” will come back around for me. For now, it still gets skipped. Will be curious after you get some more listens in. I catch many of the sounds from VH1 and II on this album. And on the jealous front, you get to see them live here this next week. I still have to listen to this. I’m bad. Will be curious to hear your thoughts on the album.